When it comes to offer vintage retro-themed furniture pieces and lighting systems, Elemental’s exploits clearly surpass that of most recyclers we’ve seen thus far. Antique, recycled, reused, re-imagined and absolutely green – each of their products lends a sort of modernism to your contemporary space. Sympathetic restoration is the mantra that has motivated the Spitalfields, London-based manufacturer to fashion inspirational home décor pieces. We came across a Reclaimed & Mirror Polished Lamp at Elemental, which has a cage with a thick clear glass lens attached to it. 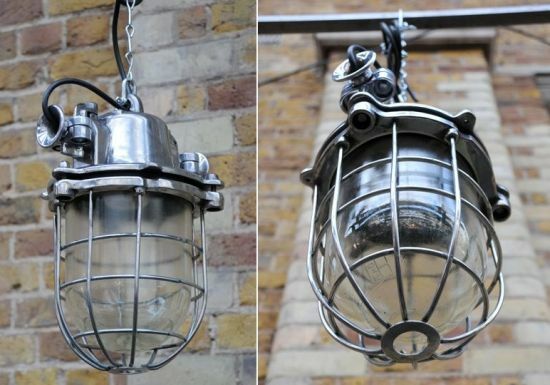 Highly ornamental and usable, the unique lighting system comes equipped with 1m of polished steel chain and black flex cable for allowing users to hang it where they feel like. With dimensions reading width: 28cm; height: 40cm; depth: 22cm, the one-of-a-kind piece, which can be labeled as Mine Lamp, will sure add an inimitable retro appeal to your home décor. Those who feel more than tempted to lay their hands on the Reclaimed & Mirror Polished Lamp may visit Elemental and get one for £600.00.